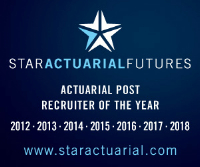 A qualified actuary ideally with good longevity and/or credit risk knowledge and experience. Good understanding of the key financial and life insurance risk areas for insurers and the actuarial controls necessary to ensure these are managed prudently. Good technical understanding of areas such as ICAs, SII (standard formula and internal model), stochastic modelling and realistic balance sheets. Good working knowledge of the relevant PRA rules and wider professional guidance. Good understanding of the life insurance market in the UK, key industry issues and trends. Good knowledge of Word and Excel is essential; programming experience (in particular in R) would be desirable. Self-motivated and outcome-focused. Takes full responsibility for all tasks, deliverables and deadlines allocated. Good communication and interpersonal skills, including the ability to put across complex technical issues and solutions to non-actuaries. Be able to work effectively on an independent basis as well as part of a multi-disciplinary team. Ability to integrate well with the existing team and work effectively and collaboratively to deliver business objectives. Ability to give/receive constructive feedback and coach others with a view to improving their/own performance.